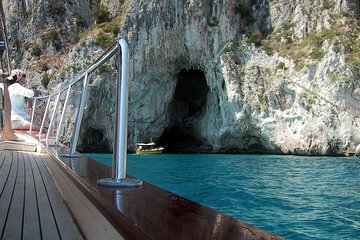 Explore a beleza selvagem do litoral de Capri em uma excursão particular de barco de 3 horas. Partindo de Marina Grande, navegue passando por penhascos escarpados e cavernas escondidas, incluindo a pitoresca Gruta Azul. Ao longo do caminho, seu capitão e guia pessoal compartilhará lendas da ilha e indicará destaques, como o Farol de Punta Carena e as antigas ruínas dos Banhos de Tibério. Pare para nadar ou mergulhar com snorkel, se quiser, e desfrute de bebidas gratuitas e de um lanche leve a bordo enquanto você aprecia o sol do Mediterrâneo nesta aventura inesquecível. We chartered the private half day cruise and it was perfect. Our captain and skipper were wonderful. They gave us the best treatment and made our 3 hour cruise delightful. We will book this trip again next time we’re in Capri. Excellent service and the best way to see the main features of the island. The boat is well prepared, with a nice shade to enjoy the views, a clean bathroom, and plenty of beer and other cold beverages. Captain Francesco sailed around the whole island, showing and explaining the main sights, while also giving my wife an me a nice and private time to enjoy the tour. This review is long overdue - we took this tour in July...and it was amazing. It was just me, my husband and the captain. We got to see all the Grottos, got to swim several times, drank wine during the tour and our capitan Antonio had sandwiches for us and spoke very good English, which was helpful. The tour itself was about 4 hours and it was definitely worth the money, such a beautiful place, so romantic. If you are going on your honeymoon, I highly suggest this tour!